They are prevalent in all aspects of life and business and the management of the retail supply chain is no exception. 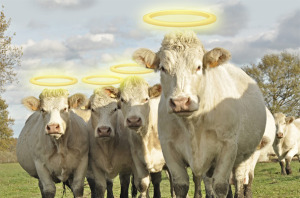 I like to think of sacred cows as “universal assumptions masquerading as universal truths”. What makes them particularly insidious is that there’s a kernel of universal truth in every universal assumption. The universal truth is that promotions to consumers can have a significant impact on the supply chain known as the “basketball through a garden hose effect”, meaning that operations and suppliers need to see the volume spikes coming well in advance in order to properly prepare for it. Further, promotions are particularly important to retailers, because it’s not a good look when customers are enticed to sacrifice their time and energy to make a trip to the store only to find bare shelves for items that are being promoted. The universal assumption that springs from this universal truth is that the planning and ordering process for promotions must be separate and distinct from the process for satisfying “baseline” sales. Large orders need to be placed with suppliers months in advance, even though the normal lead time is 7 days. Shipments of promotional goods (both inbound to the DCs and out to the stores) need to be segregated with a big red bow on them so that everyone knows how important they are. And when promotional stock arrives at the DC, it must be immediately allocated to the stores as soon as possible to make sure everyone is ready. Here’s the problem: Every survey published for the last 20+ years has shown that retail out-of-stocks average 8% overall, but that number climbs to 15% when an item is on promotion. Mission NOT accomplished. Do you truly need to violate the universal supply chain principle of postponement by committing to promotional volumes with a longer lead-time? What if you instead just updated your sales forecast and shared a continuously updated time-phased purchasing schedule with suppliers (which they would use for their production planning activities) and only locked in the order when it’s time for them to pick, pack and ship? Is a “locked in order months in advance” the only way to notify the upstream supply chain about a large need, or can the same time-phased schedule be cubed out to see the impact on operations? Maybe in the grand scheme of everything that the operations will need to deal with during that period (promotional and non promotional volumes), the “big spike” on some particular items coming up on promotion may not even be noticed. Is moving product to the stores far in advance of a promotion the best way to “be ready” or does it just result in backroom congestion until the promotion begins? The universal truth about new product launches is that – in a similar vein to promotions – there is a significant volume surge to fill the shelves with new items and considerable uncertainty about what will happen after a new item hits the sales floor. Similarly, the impact of increasing or reducing an item’s space allocation store by store may likewise cause artificial replenishment spikes or troughs. The universal assumption is that, similar to promotions, the movement of stock from suppliers to stores to support product line changes must have its own unique process – purchase orders with red bows on them, separate allocations of stock to the stores, “DC holdback” schemes, etc. If the Line Review process defines the “start selling date” for new items and the planograms by store for the new product line, why not just plan directly with this information? The sales forecast at each store is zero until the start selling date and the minimum stock requirement as defined by the planogram is effective a few days prior in order to allow store setup time. Not every store will necessarily have the same start selling date or lead time to its servicing DC, so allowing the product to flow as required to meet the merchandising need can actually have a smoothing effect on the extended supply chain. What to do about items that are being allotted more or less space? Isn’t that just a function of the store’s future inventory position at the time the new planogram becomes effective? The future minimum display quantity is known, but the exact future on hand balance is not. Plug in what you know and continuously replan (and share) the needs from the supplier to the shelf until it’s time to commit. The universal truth is that committing to purchase product from a supplier is a risk. You are relinquishing the company’s cash to buy assets that may or may not provide a suitable return on investment between the time the product ships from the supplier until it ends up in the hands of the customer. It’s important to make sure that the decision is sound. The universal assumption to address the risk is that a human being needs to approve purchase orders before they are released. Is the order quantity not the ultimate culmination of current decisions and assumptions around assortment, sales, pricing and stocking policies? If you’re comfortable with all of the inputs, then why would you be questioning the output? If you’re NOT comfortable with the inputs, then isn’t that where time should be spent? If you’re planning on a continuum, then sales are always happening, inventory balances are always changing and the net requirements are always being adjusted. How does it help anyone to make 11th hour changes to plans that have been continuously evolving for weeks or months? To be fair, these “sacred cows” have sprung up over time out of necessity. Retailers have been burdened with siloed planning and replenishment processes that provide no upstream visibility beyond the next order and – quite often – no forecasting capabilities at all. The vast majority are still burdened with them today. That said, it’s 2018, not 1988 when a lot of those universal assumptions were made. Perhaps it’s time to start making some “sacred cow meatloaf” – I hear it’s delicious. This entry was posted in Blog, Newsletter and tagged The Right Flow by Jeff Harrop. Bookmark the permalink.